Matching Properties to Applicants and Applicants to Properties can be done easily in BDP. To use this feature, click the Find Buyers icon in the Tools menu, or click the Find Buyers icon at the top of the screen. This searches your applicant database for all applicants with a saved search that contains matching criteria and it displays a list of these applicants in a slide-out panel. Tick those applicants you wish to include in the email send-out and click “Send to Selected”. This sends a property information email based on a template set up by your BDP administrator. Any applicants previously emailed will be excluded, however if you wish to also see those names, click the “Previously contacted” icon at the bottom. Only applicants who have consented and supplied an email address are available for selection. This widget is used in an Applicant’s record to add search criteria. It is possible add multiple searches to an applicant’s record. 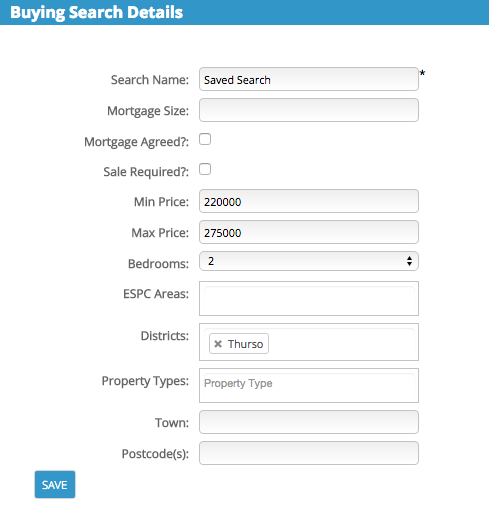 Search BDP for all matching properties and display a list on screen. This will show all property whether online or offline, pre-market, sold, etc., but not archived. *Search my website for all matching properties, which will only display online properties visible to the public. *Only relevant if using the BDP jQuery snippet to power listings in your website – NOT API. The match is performed on all fields, so if you don’t see the results you expect, try broadening the search criteria.